Want to know where to celebrate the 4th of July and watch fireworks? There are several events you can attend in Panama City/Panama City Beach for your Independence Day celebration. See you there! 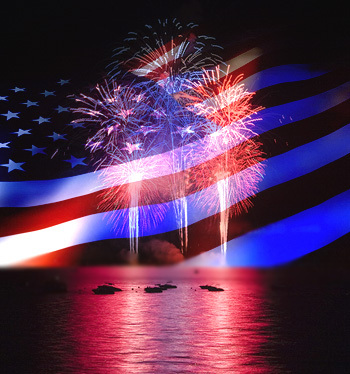 Hosted by Grand Lagoon, offering an evening of music, fireworks & freedom! The music broadcast starts at 8:00 and at 9:00 the synchronized fireworks display will happen over Grand Lagoon! Fireworks from the City (Russell-Fields) and County (MBMiller)Piers. Tune into our partner radio stations Kick’n 103.5, BOB FM 105.1 or Hot 107.9 to enjoy the live music simulcast presented by Powell Broadcasting. The best place for viewing is right on the beach so be sure to bring your beach chairs and enjoy the show! Come celebrate Independence Day at the Panama City Marina with great live music, lots of food, and plenty of vendors starting at 2:00PM and fireworks to follow that night. Annual Beach Bash and Light Up the Gulf Fireworks Show at Boardwalk Beach Resort. The Beach Bash will feature great live music, food and fun. There will be something for everyone with beach activities happening all day long. Starts at 11:00AM with fireworks to follow later in the night.